It seemed a fitting way to end 2018. 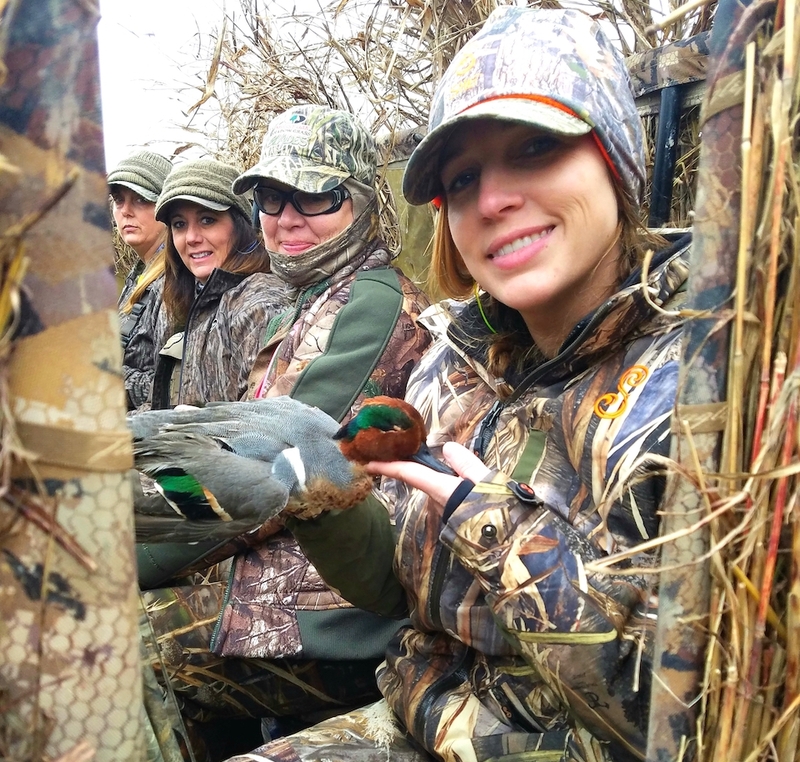 Invited to tag along on an official Shoot Like A Girl, The Sisterhood Of The Outdoors’ annual duck hunt, I decided to pack up the car and head south for hunt with some women whom I knew would make the trip worth it. 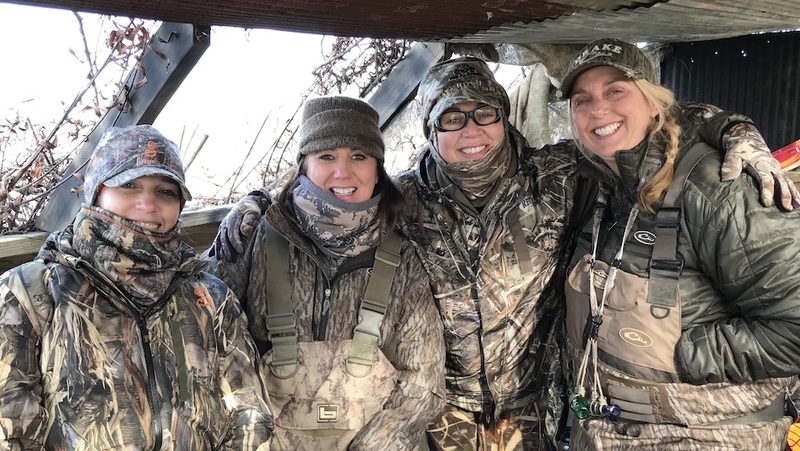 Four of us had arranged to hunt together, which included The Sisterhood Of The Outdoors’ owner, Amy Ray, along with one of her staffers, Holly Morgan. 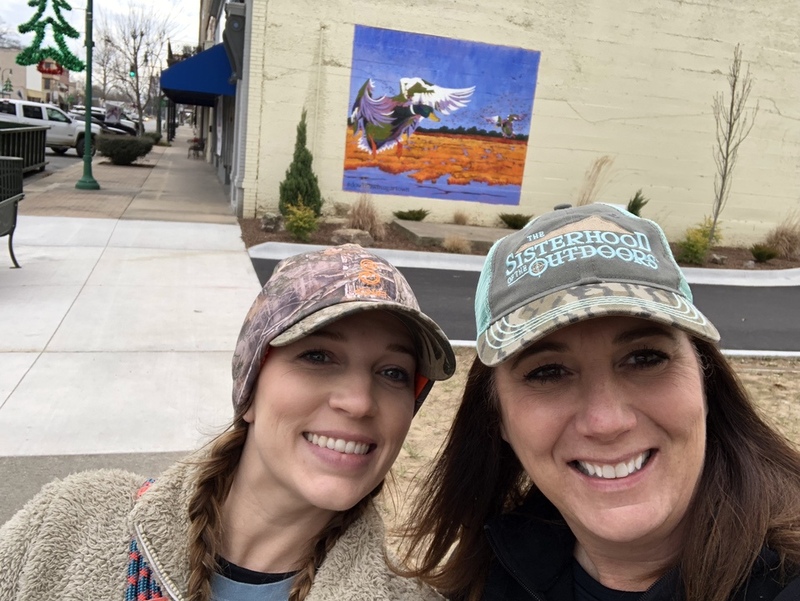 Lana Van Winkle, reigning female world champion duck caller, came down from her home in Batesville, Arkansas, for the weekend. Everything seemed in place. … except, the ducks weren’t there. 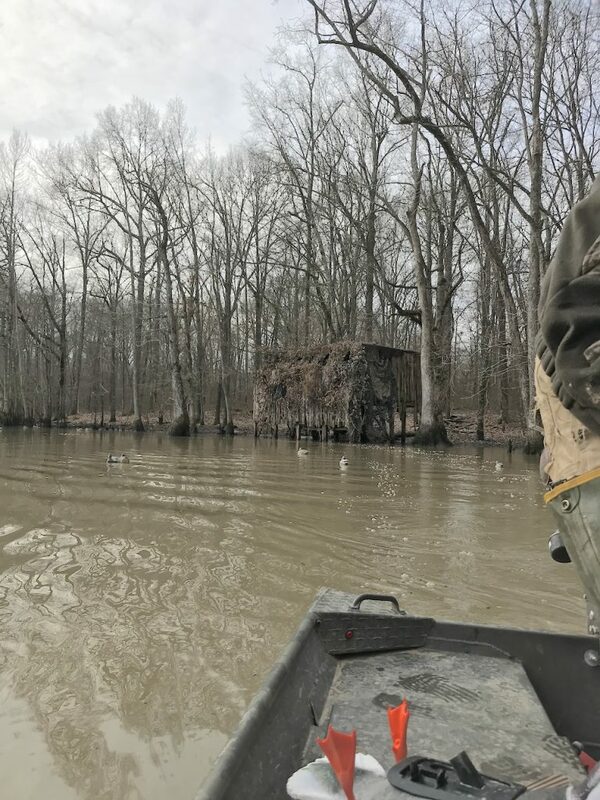 According to Buster and his crew of experienced and personable guides, most of the ducks sat on ponds and lakes north of the state because the weather had been so unseasonably warm. I’m going to tell you the rest of the story in this photo gallery below, and as you will see — it really didn’t matter about not taking home enough duck for a gumbo. The first morning, with a 4:30 a.m. wake-up call, found us on a pond in a rice field. L-R: holly Morgan, Amy Ray, me and Lana Van Winkle. The temps fell to below freezing and we bundled up for our first outing to a nearby pond. Our guide, Matt Emerson, had the foresight to wrap up some left-over BBQ ribs in foil packs. Later in the morning, those ribs tasted real good after being warmed up on the propane heater in the blind. Not a single duck landed on that pond and it wasn’t for the lack of Matt’s calling. Lana joined in, too, so that should have sweetened that pot. 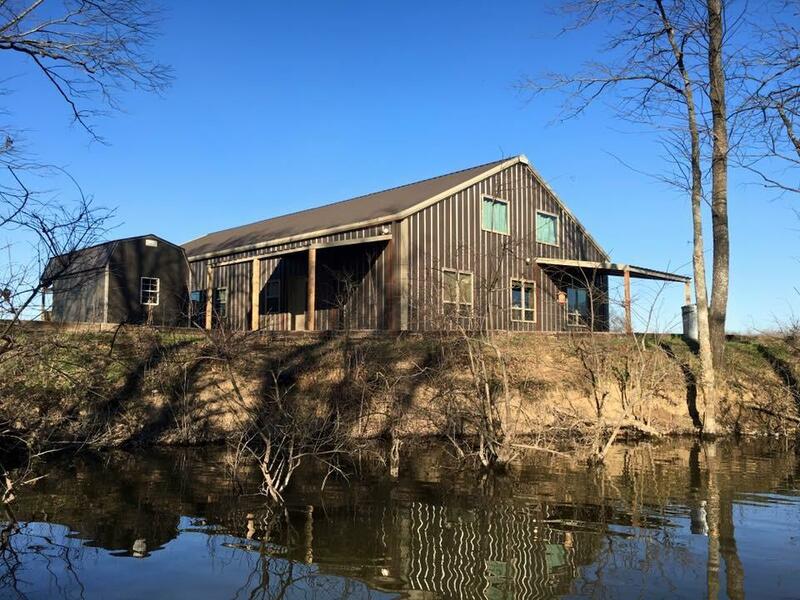 Other hunting groups from the lodge had minimal success — such as a total of 4 ducks down — at their locations. Dry times. 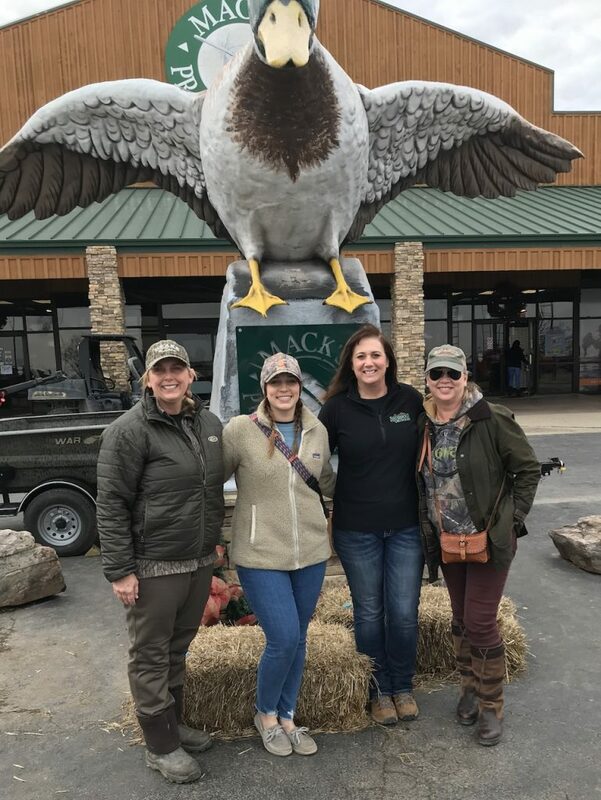 When it came time for an afternoon nap, we opted out and headed to Stuttgart instead, aka the “Duck Capital of the Dang World,” where we made our first stop at the world-famous Mecca for duck hunters, Mack’s Prairie Wings store. Amy and I purchased the obligatory Mack’s official camo hoodies, while Holly settled for a tee shirt. 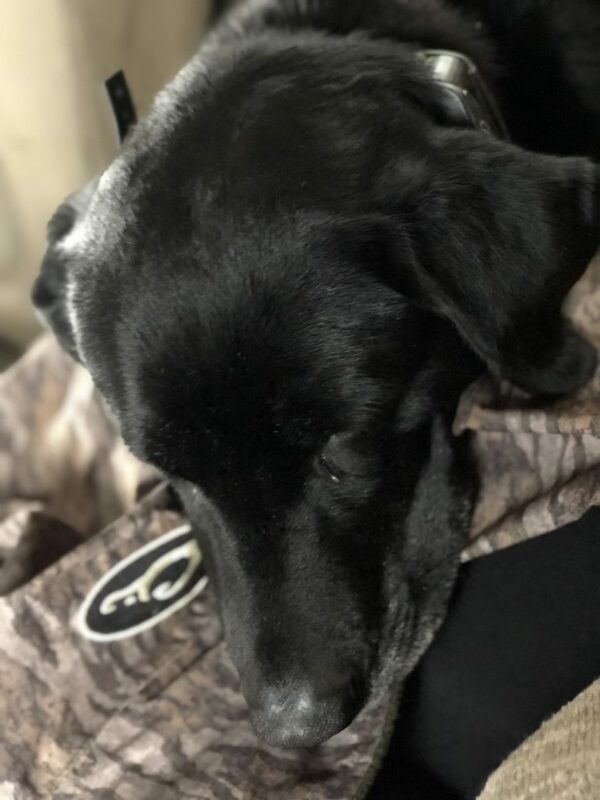 Lana explained various decoys to us and also, made a few suggestions for Drake waterfowl wear, a company that sponsors her, and that she believes in. By the way, if you want to learn more about Lana, we featured her in a Remington-sponsored “She Guides” installment a while ago. She looks so tiny on that stage, where she has won 2 female world championships for duck calling. 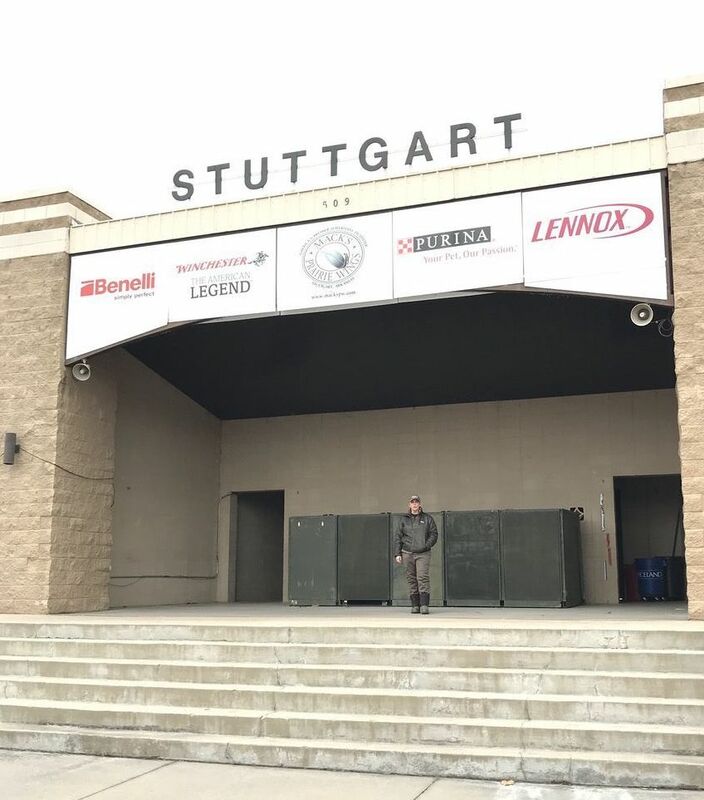 That’s Lana Van Winkle, and she showed us how it’s done — in downtown Stuttgart. We proceeded to check out downtown Stuttgart, including locating all the tchotchke ducks we could find in novelty stores, junk shops and antique stores and of course, sending the photos to Buster with this message: “Found another duck!” That man is a good sport. Holly and Amy found a big duck in downtown Stuttgart. 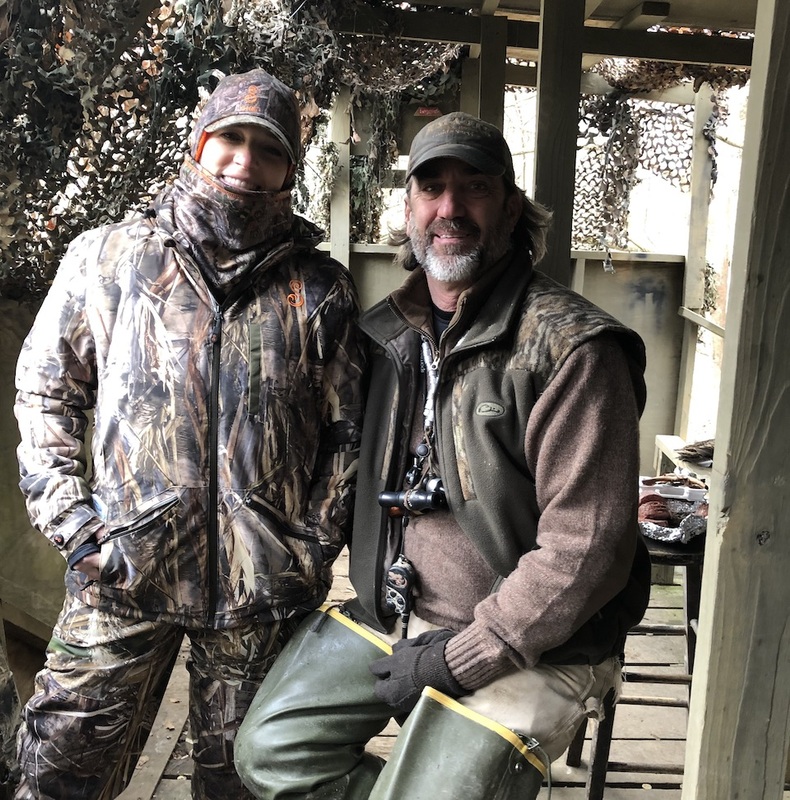 The next morning, Buster became our guide, as Matt had an emergency to attend to … and he took us to his favorite blind in the world. And we think he tells all his clients that every blind is his favorite. However, it was lovely and came complete with a heater and a jerk-string to make a log below move the water around in the river in front of us. And, it was all set up with duck decoys. All we had to do was wait for it. The Doctor’s Blind on the Cache River, a place that Buster said he’d always wanted to hunt as a kid, and now he leases it. And wait we did. Buster called his heart out, and Lady, his wonderful Lab retriever patiently waited for the call to action — which only came once. I haven’t revealed that Holly had never been on a duck hunt or shot a duck. Here’s where the hunt turns into a story … while Holly ducked out behind the blind to attend to the call of nature, two mallards came in and landed. Buster, who had been in the front of the blind resetting a decoy or 2 when Holly ducked out back, and who had returned to the blind, started to get frantic. “Where is she?” and “She’s going to miss the ducks.” She did. I didn’t. I hit a gorgeous drake and watched him fall into the river and promptly get swept down river. Lady went out to get the other duck, a hen. I hate when that happens, and Buster and Lady went looking for my missing mallard while Holly came back into the blind, regretting her decision to hang out in the woods at that time. 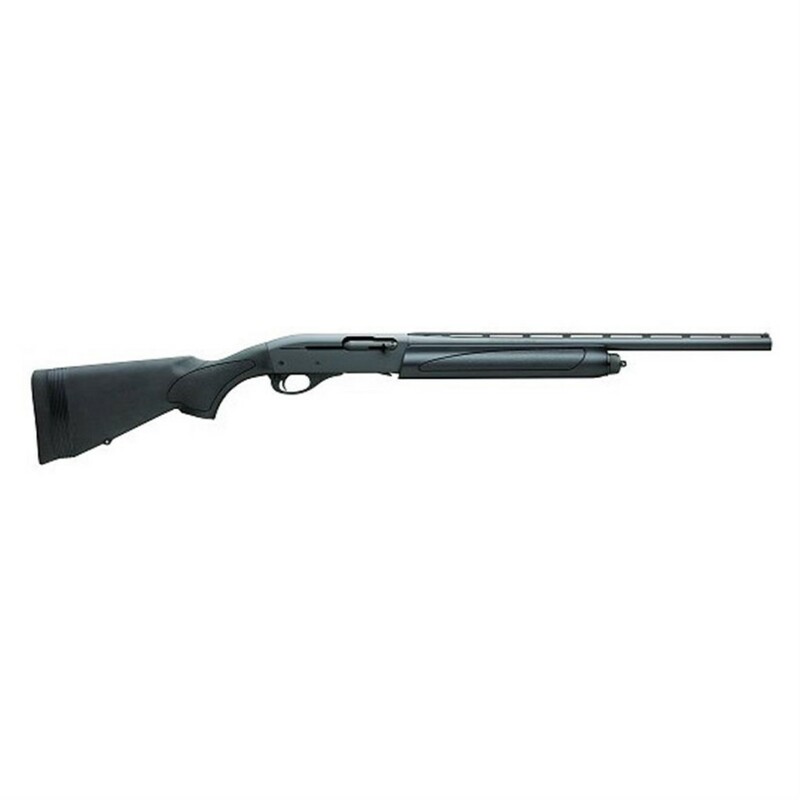 I took my trusty Remington V3 Field Sport shotgun to the duck hunt. This gun is a workhorse in the duck world. Low recoil and in a semi-auto setting means lots of shooting, if you get into lots of ducks. I paired it with Remington’s Nitro-Steel shot for my 12 gauge, which is why the mallard went south fast at about 45 yards and dove into the water. That was all she wrote about that spot, too. Buster got a phone call from a pal down at his new place in the Delta of Mississippi. Supposedly, there were thousands of ducks there. “What are we waiting for?” I asked. He agreed and we packed up the boat and headed back to the truck, then to the lodge and then on to Mississippi, which lies about 2 hours or so away. Along the way, we munched on cold hot dogs (lunch) and filled out our online Mississippi hunting permits for waterfowl via Smartphones. We all were on a mission now: Get Holly her first duck! This is Lady on her way to Mississippi, resting up for what we all hoped would be a lot of action. We arrived around 1:30 p.m. By this time we had about 3+ hours to get Holly her first duck, and by gawd, we were determined. Buster took Lana and me out first, to set up a blind on a flooded field, and there they were — probably around 3,000 ducks lit into the sky at our arrival. That sight is forever etched in my memory bank. If I could have stepped off the transport vehicle, loaded and shot as they flew overhead, I would have surely gotten a couple of ducks. Alas, by the time we got set up on this spot — where Lana worked to put out decoys while Buster went back to get the other 2 — only a few ducks returned. Most of them went to a nearby farm pond. We could hear them. And then, such as in most good hunting stories … when you least expect it, it happens. Three teal landed and when we stood up they flew up (as we wanted them to do) and Holly aimed at one and hit it squarely. She knew she hit it and Buster confirmed the shot. Lady got her swim in, and rewarded Holly with a beautiful green-wing teal. About an hour before sunset, the skies spit rain and then, chucked it down on us. Buster had told us to hang on and that the “magic half-hour” would begin shortly. Clearly, the ducks weren’t feeling the magic any longer and they probably figured out we had an ace shooter in our midst. After breaking down the blind and heading back to the truck and by this time, peeling off our waders, we decided to go to a Mexican restaurant, and basked in the glory of Holly’s first duck. The weather worsened as we headed back to Arkansas. The next morning, we all decided that we would call the hunt off early; it was New Year’s eve, and we thought it might be nice to get home to celebrate with our families (and it was still raining). So, we sat around and enjoyed leisurely cups of coffee with our Pop Tarts and Honeybuns. This was a great place to enjoy morning coffee, in the living room of the lodge. And, we talked about doing it again next year. 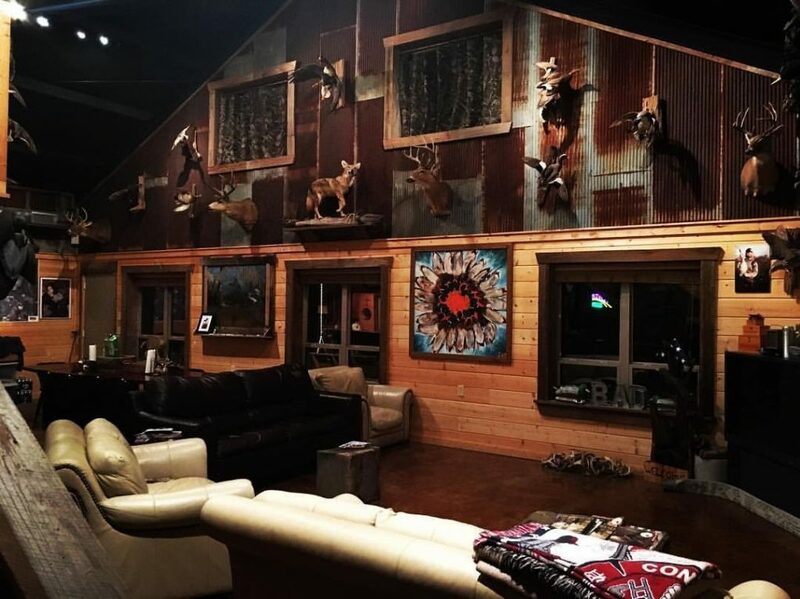 Check out the wide variety of hunts and events that The Sisterhood Of The Outdoors is offering in 2019. Book a hunt with Bust-A-Duck Guide Service for next year.